Mat forming with slender, rooting stems of pointed, linear, yellow-green leaves, about 1cm long. 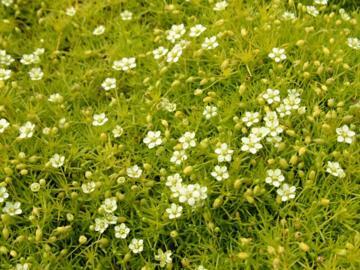 Small 5-petalled white flowers borne on short stems in summer. Moist but well drained, poorish, acid to neutral soil in full sun or light shade in hot locations. Dislikes hot, dry conditions. Low ground cover for rock gardens, alpine beds or between paving. From central and western Europe.